TTN is the The Things Network that provides the required backend services and infra-structure for supporting IoT (Internet of Things) connectivity that uses the LORAWAN protocol. Anybody can participate on the Things Network by either providing the radio gateways that feed the received data to the TTN backend that, then, delivers it to the user applications, and so increasing the coverage of the TTN network, or just use the network by building TTN Lorawan nodes. This post is regarding the later case, the build of a simple node based on an Arduino board: the Arduino Micro Pro. So why the Micro PRO, these are quite more expensive than the normal Arduinos, but come in two versions: 5V and 3.3V. Since I’m using the SX1276 Lora radio that works with 3.3V, I’ve chosen the 3.3V Arduino Pro version so that I do not need to use level shifters if using a 5V based board. Also the Arduino Micro PRO chip, the Atmega32u4 has embedded USB connectivity/port, so no need for serial adapters and/or supporting chips which, at the end, might lead to lower power consumption. Right now, on sites like eBay and Aliexpress, boards like the Lora32u4 come at least in two versions: with the Atmega328p and with the Atmega32u4. Both suffer the same problem, the Atmel micro processor used only has 32K of RAM available which might be too short to be used for some applications. This is because the LMIC, the Lorawan stack, takes a huge amount of space if using the original IBM version. A much more memory efficient version for Arduino, originally ported from IBM code, but using a different AES encryption algorithm also exists and saves a lot of memory space. We will see about that. The great advantage of these boards is they also have connection and charger for a LiPo battery, so in reality all we need is to add sensors, battery and our code. An example of such board is the BSFrance Lora32u4 board. While I’m waiting for my Atmega32U4 based Lora32u4 board, I’m using an Hoperf RFM95 radio soldered on board/shield designed for the Wemos ESP8266: Wemos RFM95 Lora shield. this way I can use the RFM radio either on the ESP8266 Wemos based set of boards, or, as in this case, with the Arduino 32u4. The Hallard shield as one interesting feature that is that merges all the Lora transceiver status pins by using diodes and hence only use one Arduino pin for inquiring Lora SX1276 radio status. This is needed due to the lack of I/O pins on the Wemos ESP8266 board. For this to work on Arduino we need to add a pull-down resistor to the Arduino pin that connects to the merged output. In my case I used a 10K resistor. The RFM95 radio is controlled using SPI, so we need to use also the SPI Arduino Pins, and also need to connect the Chip Select pin. After the node hardware build is done, from the software perspective the node needs now at least another two things: the LMIC stack for implementing the Lorawan protocol support over the Lora radio and, at the TTN site, the device configuration. ABP – Activation by personalisation – This means that all set of keys required to join the Lorawan network are embedded into the software. 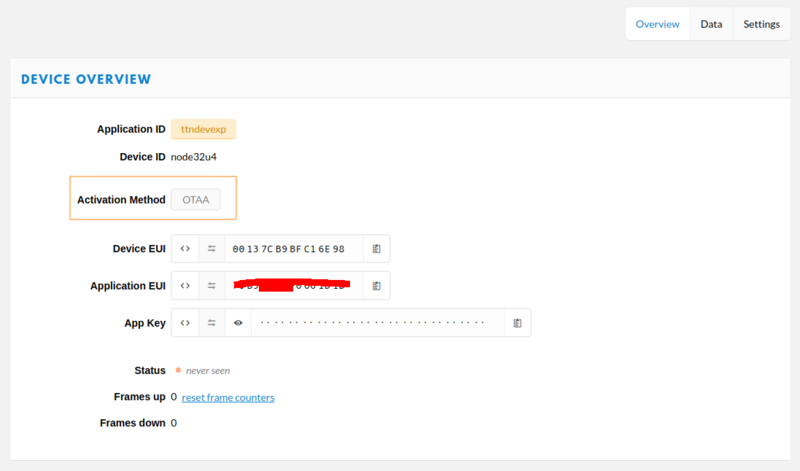 OTAA – Over the Air Activation – The network session keys needed to join the Lorawan network are generated when the device tries to join the network. On this post we will ABP first, since I have no nearby TTN gateway capable o OTTA (I’m using a single channel gateway without downlink support.). Anyway, the node code is really nothing special, except the necessary configuration for the LMIC to communicate with our RFM95 board. 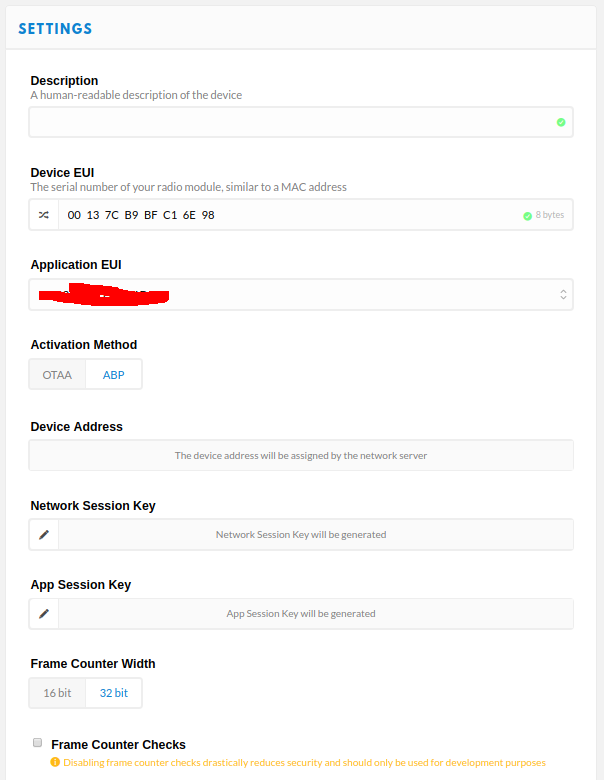 On the ABP device registration TTN page we need to register our device, so that, on main.cpp code file we can fill the required keys and device ID. As a quick introduction, after registering onto the TTN site, we go to the console and choose Applications. We can there create or reuse an existing application and register the device, making sure we choose ABP as the method to join the network. On the Device EUI field, either we fill it or press the crossing arrows to generate an ID. We let the system generate an ID, and then we can finally press the Register button. So we go to Settings and change the OTAA to ABP. After this step we have the required data to put on our code. Since our node doesn’t have any memory to track frame counting that survives reboots or power cycles, we disable the frame counter checks. static u4_t DEVADDR = 0x26304050;   // Put here the device id in hexadecimal form. And we can flash the firmware with the command: pio run -t upload. So, everything runs OK, and we can send data to the TTN Network, everything looks good, right? So in reality we can’t add much functionality to our code if using a full LMIC stack, since it occupies a lot of the available flash memory. // Uncomment this to disable all code related to beacon tracking. // Uncomment these to disable the corresponding MAC commands. So around 5KB less without the OTAA and Class B support. So we have a bit more memory to do something useful. We still have around 3K free. Tight but might be enough. The availability of boards with the AtMega32u4 processor, Lora Radio and LiPo charge and battery connectivity, is a great step to start using the TTN (or other) Lorawan networks. But with only with 32K or flash memory, for some applications, these boards might not be the best solution. Also the price for such boards are still a bit on the expensive side, since a discrete 32u4 + RFM95 + Lipo charger is a bit cheaper than the single board solution. So my conclusion is, without power considerations taken into account, a STM32F103 + RFM95 and LiPo charger, is a better alternative than the one that I’ve used here.